QESST scholar Antony Aguilar was invited to present the extended oral talk at the 2016 IEEE Photovoltaics Specialist Conference in Portland, Oregon. Antony presented the paper, Development of Cu Plating for Silicon Heterojunction Solar Cells, representing the High Efficiency Silicon Solar Cell (HESSC) team directed by QESST faculty, Stuart Bowden. Co-authors included other QESST scholars and industry partners from Technic (Krystal Munoz, Lynne Michaelson, and Tom Tyson). The presentation described an alternative metallization to the standard low temperature Ag paste for Silicon Heterojunction Cells (SHJ) cells. Antony was born in California, but grew up in Mesa, Arizona. Following high school, he enrolled in community college with an interest in forensic science, but soon switched to electrical engineering. Bouncing between four colleges to fulfill credit hours, Antony took a lot of classes while working Dave & Busters to support himself. 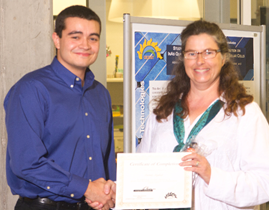 “I worked there way too long and decided if I was going to do anything with my life I had to quit.” After successfully applying to and participating in the QESST REU, Antony transferred to Arizona State University and began working in the HESSC lab. There he became known for fixing lasers, designing Arduino circuits, and installing new safety measures for lab equipment. “That’s when Stas asked me if there was a way to contact probes to a solar cell. Little did I know that would become an [IEEE] paper and even my dissertation research.” Antony transitioned to graduate school in fall 2016.